No offense, Mom, but your eggplant parmesan when I was growing up was not your strongest dish. As with a number of other foods, I have come to like eggplant as an adult. For eggplant, I think it started with baba ghanoush, then chili with eggplant, then having eggplant in various Asian dishes (Chinese and Thai especially), and finally Greek Melitzana. Unfortunately Lori hasn’t come to enjoy eggplant as much as I have, but the one dish she enjoys is the roast eggplant dip that I make. The recipe is posted on the ViciVino.com recipe page. This recipe is as much Eastern European as Mediterranean in origin and style. 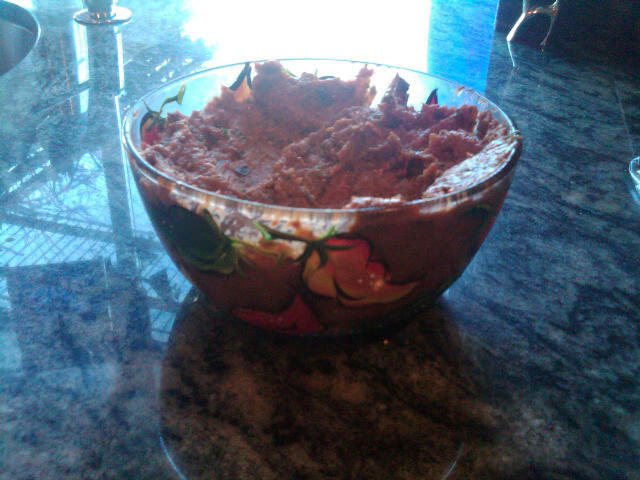 Eggplant, red bell peppers, onion and garlic are roasted with spices, then puréed to make the dip. The dip has strong flavors, and a creamy consistency, but does not taste like eggplant, and does not have the texture of cooked eggplant that some people don’t like. With those strong flavors, a good red wine is called for. Last night, serving this with friends over, we opened a bottle of Dry Creek Vineyard 2012 Heritage Vines Zinfandel, Sonoma County, which is actually a blend of 85% Zinfandel and 15% Petite Sirah. This was a nice bottle of wine, working well with the dip, and a very good value at less than $15. Quoting Tennyson in the last post, and paraphrasing Shakespeare in this one. Somewhere an English teacher is happy. This entry was posted in wine-food pairing and tagged Dry Creek Vineyard, eggplant, zinfandel on February 20, 2015 by vvblogman. We opened and drank our last bottle of Windy Oaks Estate 2001 Pinot Noir, Proprietor’s Reserve, Santa Cruz Mountains, Schultze Family Vineyard last night. We went out to dinner locally, Café Esin in Danville, and brought our last bottle with us. We’ve written about Windy Oaks in general, and this wine specifically, in the past. Maybe because this was our last bottle of this wine, or maybe because it is continuing to get better as it ages, but this was one of the best wines I’ve ever had. Wow! When wine ages — when really good wine ages — it comes together in this whole-is-greater-than-the-sum-of-the-parts sort of way. A young really good wine has the nose, fruit, acid, finish; all the different components of the wine. And each of the components is really good. As it ages though, and if the magic and chemistry happens, all those components come together like the different sections of an orchestra playing together. Certainly that’s what happened with this wine. We first visited the Windy Oaks winery around 2003, about the time this wine was being bottled. The winery and vineyard sit at the southern end of the Santa Cruz Mountains, in the Corralitos area. From the peak of the vineyard (about 1000 ft elevation I think) you can see the town of Watsonville, and out to the Pacific Ocean. With that location and altitude they get early bud break, minimal fog, and relatively low daytime temperatures. What this means is long hang time for their grapes, which are typically harvested later than Pinot Noir grapes in Napa and Sonoma counties. And long hang times translate to a lot of time for the fruit and flavors to develop, without getting a huge amount of sugar. I’d put this Pinot Noir up against the Carneros, Sonoma Coast, Oregon and Burgundy wines without hesitation. The good news as well was that we treated this wine to a very nice dinner at Café Esin. Our meals were excellent. While I’ve had their fish quite often in the past, last night the lamb shank with Turkish spices spoke to me from the menu, and it was wonderful. The spices were not too strong, and went with the Pinot Noir in a great way. The even better news is that we shared the wine and dinner with close friends who also love and appreciate wine. The salmon (had by two of us) and the pork were also great. 4 empty plates went back to the kitchen. 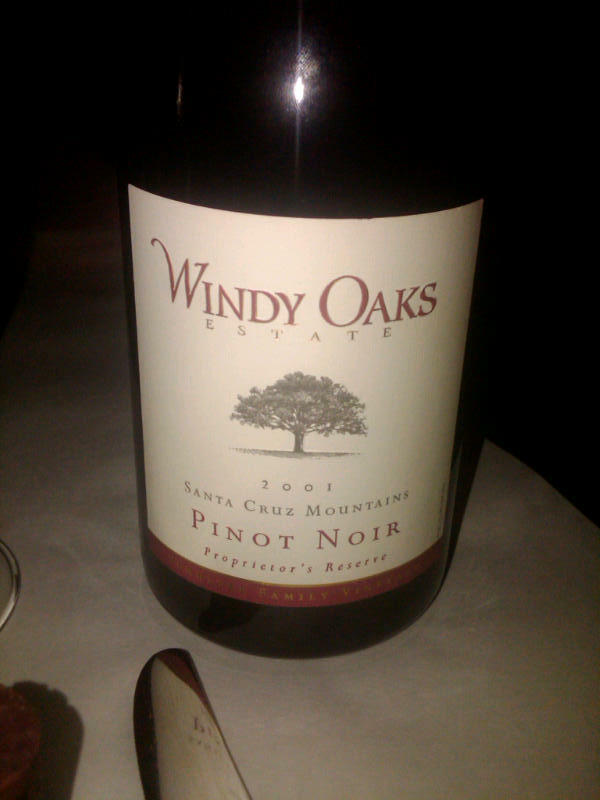 That may have been the last bottle of that vintage, but we’ve got more Windy Oaks Pinot Noir in the cellar. Still, this was such an outstanding wine, it will be missed. I guess we should go try, and buy, some of the more recent vintages. By the way, how many of you thought, as did I, that the opening was a Shakespeare quote? This entry was posted in food and wine, wine-food pairing and tagged Cafe Esin, Santa Cruz Mountains, Windy Oaks Estate, wine aging on February 14, 2015 by vvblogman.